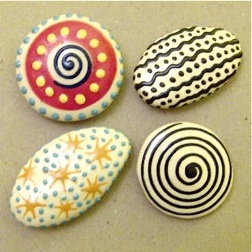 For more than two decades I have left pieces of my work and more recently decorated pebbles in odd places all around the world, sometimes in places where they would definitely be found and other times in places where they would never be found or unlikely to be found for a very long time. In a way it has been a means of leaving a little prayer to nature and all its wonders, the materials are all earth based(the clay itself, the colours and the glaze) and the objects made from them are a result of Earth, Water, Fire and Air all coming together and the X factor, human consciousness and expression. In other ways its just been a means of creating a curiosity for the finder, having a bit of fun,mischief and giving the finder cause to contemplate its significance, how it got there, who left it and why. I have dropped pieces deep in the worlds oceans, in rivers and lakes, buried them in the rain forest of central America, left them in the Australian desert, in the Himalayan mountains, on the busy streets of New Delhi, London and Marrakesh just to name a few of the places they have been deposited in the more than 40 countries of the world I have lived, worked and travelled in during the last 25 years. The idea has also been spurred by an active interest in history and archeology and having worked on many excavations around the world. I have often found myself holding a pot, a shard of pottery or relic and contemplating its origins, who was the person who made it? What was the shape of their everyday life like? Who where they? In a way its like the object becomes a channel all the way back through history to that person, it is a means of achieving some degree of immortality , especially with clay's exceptional qualities of durability with the potential to last for thousands, even tens of thousands of years.